As it turns out, Jacob isn’t just any mild-mannered boy, he has a superhero alter ego known as “The Leukemia Slayer”. He adopted the persona earlier in 2011 when his family started a Facebook page by the same name, to keep family and friends updated on Jacob’s treatment. Jacob didn’t just have a few friends, he had more like a couple thousand. Those friends donated in excess of $2,000 to what was dubbed “The Santa Slayer Project”, allowing Jacob and his family to buy more than 200 gifts for kids in the cancer ward, as well as other areas of the hospital. Not only was it cool, it was courageous. Jacob underwent a painful chemotherapy treatment immediately before he handed out presents to other children as the Santa Slayer. At that point of “front line” treatment, Jacob was skinny and had no hair. Sherry said he looked sick. A year later, Jacob is in maintenance treatment. He visits the hospital once a week for lab work, and gets chemotherapy pills about once a month. His hair is back, and he looks healthier. He will remain in treatment until 2014, when he expects to slay Leukemia once and for all. 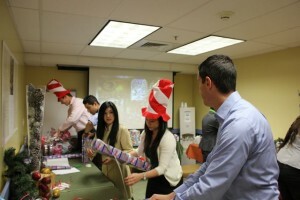 Employees of the Four Seasons Hotel in East Palo Alto chip in to wrap gifts for The Santa Slayer Project. A few months ago friends started asking if the Santa Slayer Project would return. 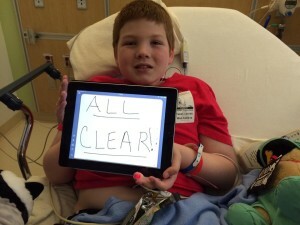 The fundraising began, and Jacob and his family raised just under $2,000, for another round of more than 200 gifts. There are too many for just the children on the cancer ward, so extras will go to children in other wards, as well as at the nearby Ronald McDonald House. The family also bought small toys and games to stock the toy chest at the hospital’s lab, so kids coming in for tests can pick out a special reward. Any money left over, or that comes after the Santa Slayer makes his deliveries, is used to create special Valentine’s and Easter gift bags. Wrapping 200-plus toys and games is a huge job, and the Goeders thought they wouldn’t be able to handle the task this year, but just as they were reluctantly resigning themselves to not doing it (“Unwrapping it is half the fun,” said Sherry), along came a Facebook message from Nicole Neal, Director of Public Relations at the Four Seasons Hotel in East Palo Alto. Neal and the Four Seasons are “passionate” supporters of Lucille Packard, she said. Through following the hospital’s Facebook page, Neal began following The Leukemia Slayer’s page. When she saw the notice about the Santa Slayer Project, she contacted Sherry and offered the volunteer help of employees to handle wrapping, as well as a donation from the hotel to cover the cost of wrapping paper and bows. 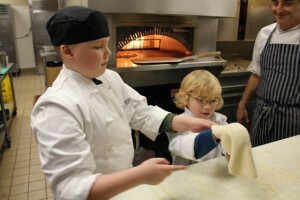 Jacob and Jordan Goeders make pizza at the Four Seasons Hotel in East Palo Alto, as Chef Marco Fossati supervises. Two weeks ago Jacob, Sherry, Todd, and Jordan visited the Four Seasons so that the Santa Slayer could check on the employees’ progress in wrapping the gifts. What the family didn’t know was that Neal planned an afternoon of surprises. For example, Neal noticed from Jacob’s Leukemia Slayer posts that he likes pizza. So after Jacob got a first-hand look at the wrapping operations by employees, he was introduced to Four Seasons Chef Marco Fossati, who presented Jacob with his very own monogrammed “Slayer” chef’s jacket. 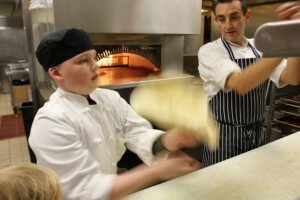 He whisked Jacob and Jordan to the hotel’s kitchen for a private pizza-making lesson. Parents Todd and Sherry said they didn’t expect that the hotel would “roll out the red carpet.” They could tell Jacob was having a well-deserved fun day. Sherry said kids with cancer have their childhoods taken away from them, when faced with an adult world of painful realities. Jacob tosses pizza dough, as Chef Marco Fossati looks on. 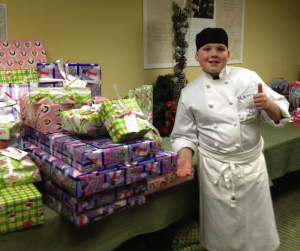 “I think it’s amazing you have an 11-year-old that thinks of others,” Neal said to Todd and Sherry, underscoring the sentiments from other hotel employees who wanted to acknowledge Jacob’s generosity. 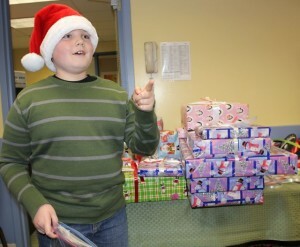 Jacob’s desire to help other kids with cancer goes beyond playing Santa at Christmas. He’s also a big volunteer with Alex’s Lemonade Stand, an organization that raises money for children’s cancer research, and Hoops for Hope, a basketball-themed fundraiser for Lucille Packard. “It’s kind of a tradition, huh?” Sherry said to her son. Why kids are so good at making a difference in the world, I asked Jacob. What’s Jacob’s advice for other kids and grownups about how to help others? Wise advice, from an 11-year-old who is making the holidays just a little brighter for other kids. 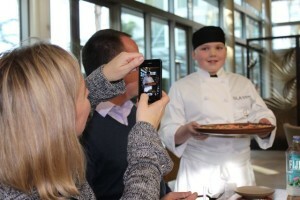 Sherry Goeders takes a photo of her son Jacob with his handmade pizza at the Four Seasons Hotel, while dad Todd looks on.